What is is about a cute dog on the cover of a book? That's how I discovered Kristan Higgins and if I'd seen Once Upon a Wine in the store, that would be how I discovered Beth Kendrick as well. Once Upon a Wine is a perfect summer read - full of humor and emotion. It's a story of second chances, as couples and individuals, of finding ourselves and realizing our dreams, at any age, even if those dreams turn out to be different than we thought they would be. I really enjoyed my visit to Kendrick's Black Dog Bay, a small seaside town known as the "best place in America to bounce back from your breakup." The story flows well and the main characters are all believable and deftly drawn. While I enjoyed the romantic journey for Cammie and Ian, and Kat and her estranged husband, it was the relationship of the three women, Cammie, Kat, and Ginger, and watching each of them blossom and find their intended purpose that took center stage for me. Kendrick created complex characters, added in challenging situations, then blended them together with humor and heart to seamlessly to create a satisfying story that will have me coming back for more Beth Kendrick books. And, as a bonus, there's Jacques, a retired French Bulldog show dog that comes into their lives with unexpected results. I adored him! 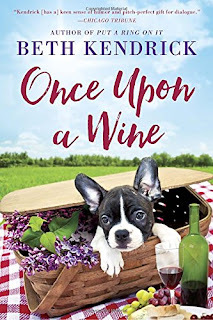 Once Upon a Wine is the fourth book in Kendrick's Black Dog Bay series but stands fine on its own. Of course, if you're like me, after reading it you may fall in love with this cute town and her citizens and download the first three books as well! They are: Cure for the Common Breakup, New Uses for Old Boyfriends, and Put a Ring On It. What new authors have you discovered this summer? Have you read any of Beth Kendrick's books? One randomly chosen person leaving a comment will receive a print copy of Once Upon a Wine. Deadline for comments for giveaway is 11:00 pm (EST), August 12, 2016. The only novel I have read by this author is "Fashionably Late" so I need to catch up on her books. New-to-me authors I have discovered this summer are: 1. Perpetua Langley - I read two of her books "Season of Grace" and "A Summons to Greystone Hall." Both are clean reads and beautifully written. 2. Tracy Rees and her novel "Amy Snow." 3. Diana Quincy and her novel "License to Wed." 4. Fiona Barton's "The Widow." I have always been a fan of books about wine making. The science and "luck" behind it all is just fascinating. I look forward to reading "Once Upon a Wine." No, I haven't read any of Beth's stories yet. This one looks interesting. I think lots of people fantasize about owning a vineyard, but anything involving agriculture is a lot of work and a lot of risk. I'll stick with visiting vineyards - love visiting the ones in Virginia! I haven't read Beth's books. This novel sounds wonderful and very interesting. I have discovered many wonderful authors this summer. Miranda Beverly-Whittmore who wrote June, Maggie Leffler author of The Secrets of Flight and Simone St. James who writes fascinating ghost/gothic novels. Beth's books sound like an escape and ideal summer reading which I would enjoy. I found a number of writers whose books I enjoyed. Ashley Hay, Dominic Smith and the books were memorable. I have found a lot of new Authors this summer Beth Kendrick for one, Anita Hughes, Wendy Sand Eckel and many more I'm loving it. Great review on this thank you it sounds very good. I haven't read anything by her, but I adore that cover! The town certainly has an interesting tagline--"the best place in America to bounce back from your breakup." Sounds like something I need to add to my TBR. I have not read this author or any new authors lately. I have not read Beth Kendrick. New person was Janet Gover and her Coorah Creek books. The best book I read so far this summer is The Closed Door. OMG I read it in under a day...very suspenseful. I think I have read one or two books by Beth. I wanted to get this one from Netgalley but was declined so will have to look for it. I have not yet read any of Beth Kendrick's books, but it sounds like I will have to remedy that. looking for others in the series. It was the first of her books I have read.